Back Cover Blurb: Every child’s compass must be made very precisely, and each one is unique. When children reached the age of ten in the town of Candleton, they began to build their compasses. The compasses were very important, as they helped guide their makers throughout their lives. So when Sayni turned ten, she began to build her compass from bits and pieces she had collected. Sometimes, though, she’d look at the unfinished object and feel as if she’s wasting her time. Yet she knew that working on her compass was the right thing to do, so she continued to collect and to construct. One day, she found herself in a dark and unfamiliar part of town, surrounded by factories, and pushy factory workers who tried to sell her generic, ready-made compasses. Sayni was tempted to buy a finished compass, but she resisted. She wanted to build her compass herself. But it wasn’t until she met the mysterious and magical Windowjet brothers that she learned how important is was for every child to build his or her own compass. Sayni decided from then on that she’d teach the children of Candleton how to create compasses that were unique to each of them. As I read this book, it became clear to me that building the compass was like writing a story, a life story. So every life experience, every memory, every feeling, everything you learn throughout your life, from the moment you’re born to the moment you leave this Earth, is part of your life story. Each person’s life story is special, unique just to him or her. Each person’s path is different too. But where we’ve been can help determine where we’re going, much like a compass can help guide us in the right direction. 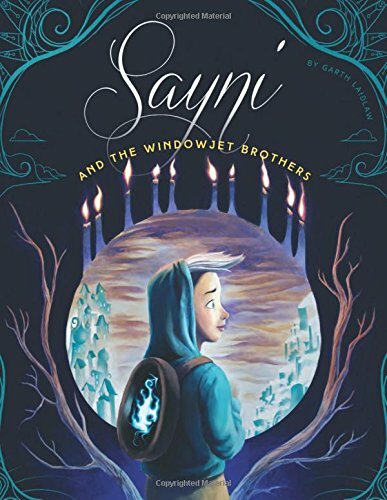 Sayni and the Windowjet Brothers is a lovely, beautifully illustrated story about embracing life, living it to the fullest (to fill up that compass), and following our own paths.